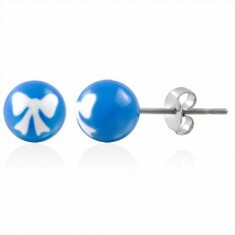 Your favorite product: Steel earrings silver color, the blue butterfly in the ring, hooks the G15.16 - is added to the wish list. 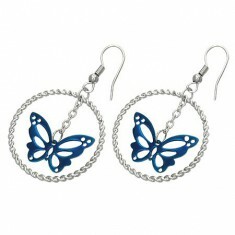 Earrings made of steel 316L in silver shade - a blue carved butterfly on a chain with a circle. Your favorite product: Blue earrings made of steel 316L, clear zirkonek in the vertical notch, articulated G16.28 - is added to the wish list. 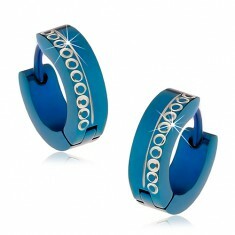 Earrings made of surgical steel in a metallic dark blue shade - circles with a cutout and a small zirkonkem. 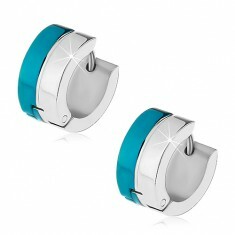 Your favorite product: Steel earrings with a hinged fastening, blue rings with notches Z43.07 - is added to the wish list. Earrings made of surgical steel metallic blue color with horizontal notches in a silver shade. 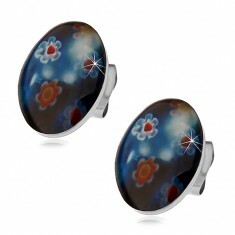 Your favorite product: Puzetové steel earrings, blue oval with colorful flowers X03.06 - is added to the wish list. Earrings made of surgical steel oval shape, decorated with multi-colored flowers and covered with a transparent spherical glaze. Your favorite product: Puzetové earrings made of steel 316L, blue-and-white skull black background of the G8.30 - is added to the wish list. Earrings made of surgical steel with a picture of a white skull with blue lines on a black background, puzetové fastening. Your favorite product: Articulated earrings made of steel 316L with stripes in blue and silver shade Z43.09 - is added to the wish list. Circular earrings made of surgical steel with shiny two-color strips around the perimeter, hinge fastening. Your favorite product: Earrings made of surgical steel with vyhloubeným blue central zone Z44.18 - is added to the wish list. 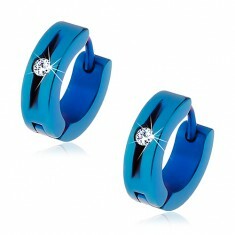 Articulated earrings made of steel 316L with a glossy belt in metallic blue hue around the perimeter, a raised edge. 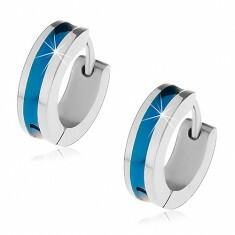 Your favorite product: Steel earrings in silver colour with a blue stripe in the middle of Z43.17 - is added to the wish list. 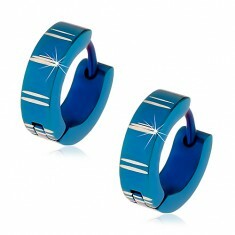 Circular stud earrings made of steel 316L with finely vyhloubeným metallic stripe dark blue color. 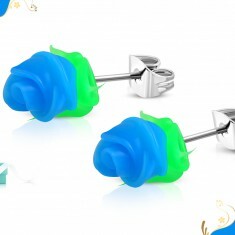 Your favorite product: Earrings made of surgical steel, blue roses, puzetky the G20.25 - is added to the wish list. 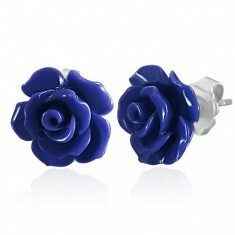 Steel earrings with puzetovým button fastening in the shape of a blooming flower roses in blue color. Your favorite product: Earrings made of steel a portrait of a woman with a baby G9.10 - is added to the wish list. Steel earrings with a christian motif - blue portrait of the Madonna and child on a white background. 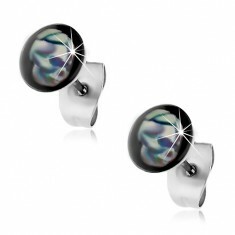 Your favorite product: Steel earrings white six M10.29 - is added to the wish list. Earrings made of surgical steel with a blue background and white six.